I can't get enough and I'm sure you can't either! Here are some products I am lusting over and am already head over heels in l-o-v-e with! I've had this concealer for over a year and a half and about 3/4s of it is still left! It doesn't take much at all to help conceal the tiniest bump to the largest of blemishes. I'd recommend it for a night out or for an upcoming photo shoot! It's definitely worth the price because it lasts so long. So obviously this is a LUST for me! I was online shopping (just looking...) tonight when I saw this product. I love how an airbrush tan looks, so I can only imagine how flawless airbrush foundation must be! I'm not a huge foundation fan but apparently the Temptu product is fine and not very heavy at all, which is what gives it's appeal. I imagine this would be ideal for a night when a ton of pictures are to be taken. 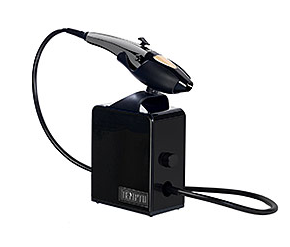 It even comes with a "How to Airbrush" DVD for those of us who don't know where the heck to start. I'm in love with Bliss, so it's no surprise that I purchased this product. You use it once or twice a week to rejuvenate your skin! Ever heard of an oxygen facial? Well consider this the at-home version! It really does brighten up your complexion. I always did it in the shower to get the steam to open my pores and then applied the mask. It turns from a gel to a foam and feels fabulous! You only need to leave it on about a minute and a half to see results (any longer and it's worthless). I ran out so I'll be getting some soon - this product lasted me awhile because you don't need a lot of it for an application. See? I told you I loved Bliss. I have my wonderful synthetic lashes now (still going strong - they have saved me so much time and look flawless), so I have to be careful when I apply eyeliner... anything I use to remove it has to be water based and oil free. Voila! I bought this remover in April before my lashes because I loved to wear L'Oreal Voluminous Waterproof mascara and it was great for easy and painless removal. When I had my photo shoot, I wanted to look flawless! I read up on the do's and don'ts of shoots and it said that I needed a good powder on hand. So I ran over to Sephora and found this little baby - it's compact so I could easily fit it in a clutch and it not only comes with a white powder (it looks invisible) but also little blotting sheets! Two great products in one?! Perf! It also comes with a handy mirror. In my opinion, you can never have enough SPF. Besides applying it before my moisturizer, using a moisturizer with SPF already in it and using make-up to protect my skin, I love this little brush! 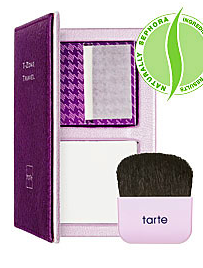 It keeps a powder SPF within it and with a simple twist it is released into the brush and ready to apply. Use it outdoors during a day at the ballpark or even at the pool to keep skin protected. The best thing about pots of loose eye powder is that they last for-ev-er! Or maybe it's just the Make Up For Ever brand - regardless, I've had my bronze brown pot for about two years now and it's still going strong. I don't see it going anywhere anytime soon! Browns look good because my eyes are a darker green, so I love to make them pop at night with this shimmer. A few years ago I was reading some gossip mags and saw that a lot of the celebrities have really dewy, glowing skin on the red carpet. I wanted to emmulate that look, so I did some research and saw the new "rage" at the time was to use a product that creates an artificial lighting technique. I, of course, go to Sephora and asked a beauty expert what product would work for me and she suggested Clarin's Complexion Perfector. I'm so glad she did because this stuff does wonders! It's great during the day because it lights up your face (even during the worst of hangovers) and it has endured many years in my makeup box. A common theme with the products in this post is that they last a LONG time. This eye creme is no different. It goes on evenly, doesn't crease and the color is light enough to work during the day or night. I apply it with my pinky finger and it looks natural - a little darkening of the eyelids can give a sultry look. Just don't overdo it or you'll end up looking like a crackhead. There is no need to spend $20 on eyeliner because Sephora's line is just as great and has a lower price tag. I use their Kohl eyeliner for a night out; sometimes I'll switch it up to their liquid liner in black. During the day I use a light brown and it lasts hours without smudging! If you do want to spend a little extra, I'd recommend Make Up For Ever's eyeliner - if you can get past shilling out the dough for a pencil, you'll love the results. Want a fresh flush but not a ton of heavy powder? 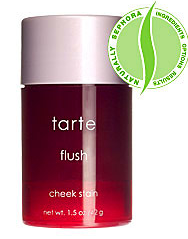 Go for this cheek stain. It's especially great for a no-nonsense summer look, but looks great in the winter as well. Somedays I'll wear bronzer, a powder, and I don't like to go overboard with powders on my face to avoid looking cakey or too made up. This is a great alternative and won't melt off your face like most liquid blushes. Fresh is a decadent line of light and fluffy washes to delightful and rich scrubs. When I get a few extra bucks, I love to buy this wash because it smells delicious and it keeps my face feeling soft and moisturized - never dried out. Since I do a lot of my exfoliating products at night, I like to use this in the morning to wake up my skin. They also make a cute travel size version for $9. Sephora is wonderful and has a gift registry! So if you have a birthday coming up, or just want a "surprise me!" gift, go here to sign yourself up and start selecting your products! Then send your list to whoever you want so they can keep tabs on what you're lusting over. Also, if you ever want to try out a product before you buy, go in and ask for some help - the beauty consultants will make you a sample size of anything you want (anything - including eyeliner)!